Link Posted: Mon Apr 13, 2015 8:48 pm Post subject: HERMS vs RIMS? HERMS? RIMS? What's the difference? Blichmann RIMS Rocket. A popular choice for RIMS. I get asked all the time which is better for heating the mash/wort: HERMS or RIMS? This article will provide some information as to why I choose HERMS over RIMS for my design. Both HERMS and RIMS add heat to the mash through a separate heat source while the wort is (usually) recirculated continuously. When properly designed and used, both provide a means to very accurately control mash temperature. They are both 'set it and forget it' approaches. On a HERMS (Heat Exchanged Recirculating Mash System) setup the wort is gently heated by pumping it out of the Mash/Lauter Tun (MLT) and recirculating it through a (usually) stainless steel coil submerged in the Hot Liquor Tank (HLT) water before it is returned to the mash (see picture below). Because of the constant recirculation during the entire mash period (usually 60 minutes or more), both produce an incredibly clear wort going into the boil kettle. Think of it as a continuous vorlauf (German for "recirculation"), the process of clarifying the wort being drawn out of the mash tun. This helps minimize the amount of grain particles introduced in the boil which we want, as boiling them can produce unpleasant flavours (mostly from the lipid-rich embryo and the phenolic compounds in the husk). The heating element in the HLT heats the water and the water heats the wort passing through the coil. This is an indirect approach to heating the wort. The two liquids are never more than a degree or so apart, and the wort can never go above the temperature of the water. A RIMS (Recirculating Infusion Mash System) setup is similar in that the wort is also pumped out of the MLT but this time it passes through a small chamber (often a pipe or a tube) that contains a heating element. The wort is directly heated by the element, often to a temperature much higher than the target point. The wort is then returned mixed in with the rest of the mash. Setups can be designed around both. Both can and will make excellent beer when properly designed and used. My design however is based around HERMS as I find there are less risks, less caveats, less cost, less complications as compared to RIMS based designs. What are the downsides to RIMS? Risk of scorching the wort if the pump is stopped for even a short period of time (seconds), ruining the entire batch. This makes the beer taste like an ashtray. It is not a subtle smokey flavour (like in a rauchbier). It is not something that can be fixed. If this happens the batch has to be dumped. This situation can never present itself with HERMS given that the wort in the coil is never heated past the temperature of the HLT water. If RIMS is to be used, I'd suggest interlocking the RIMS element with the pump that is used to move the wort so that the element can't be on if the pump is not also on. Even better would be some sort of flow interlock as the pump head may be clogged or the pump valve closed. In other words, use a flow valve of some sort to check if wort is flowing before you allow the RIMS element to be on. This of course adds extra cost/complexity/cleaning. The fact that you can't run the RIMS element at the same time as the HLT element on a standard 30 amp dryer circuit (a 40-50 amp circuit is required). RIMS is used to heat the mash while the HLT element is needed to heat the sparge water. With HERMS and my brewing process this is not an issue as the HLT and mash are heated using the same element. The mash always follows the HLT temperature so it's only natural to use one element to heat both. I see no advantage to using separate heating elements as you will always want to increase both to eventual mashout temperatures (~168F) before starting to sparge. Controlling them separately has no benefit. The non-gentle heating of the wort which may deactivate the enzymes due to overheating. With HERMS the wort is never heated past the HLT temperature since both are at mash temp. Note: This is generally considered a low risk with RIMS given that alpha amylase (the primary enzyme in conversion of the malt starches to sugars) begins to break down at temperatures above about 160F and evidence shows that it takes a considerable period of time before a significant portion of the enzymes are compromised. The relatively short period of time the wort is at a high temperature is probably not a problem. More expensive, more complex, more parts. RIMS requires a third element and in most cases will require more than 30 amps so a larger control panel with more parts is required. A tube or chamber of some sort to hold the RIMS element is also required. Given that the tube must be cleaned after each use it's often held together by quick release tri-clamp (tri-clover) fittings, further increasing the cost. (Some will use less expensive NPT pipe fittings but having to take a wrench to your RIMS tube to disassemble/reassemble every time you brew grows old fast). 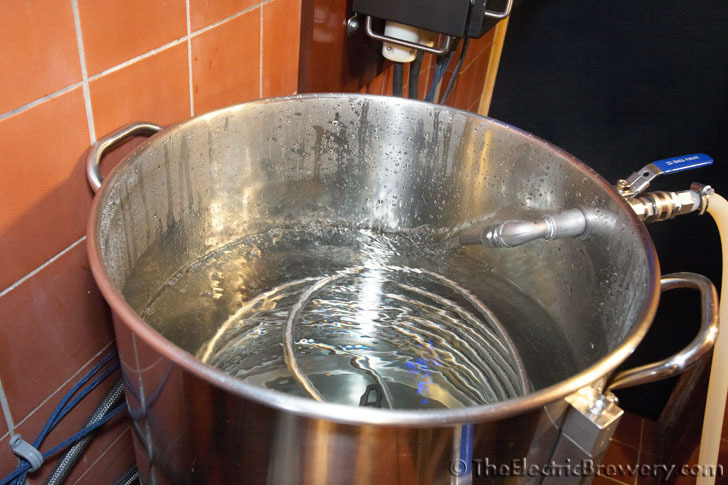 A separate HLT is still required to heat up water, including the sparge water. With a HERMS setup the HLT with integrated HERMS does double-duty. Because the mash temperature and HLT temperature are always be in sync, it makes sense to combine instead of having separate vessels. Extra difficulty in cleaning. The extreme localized heat and use of a hidden/embedded heating element in the RIMS tube means the element gets baked on crud (exactly the same as happens in the boil kettle - that element needs to be sponged/cleaned off and the one in the RIMS tube is no different). This requires you to disassemble the RIMS tube completely to clean the element after every use unless you use some strong (caustic) cleaners made for CIP (clean in place). With my design the HERMS coil is automatically cleaned during sparging because the hot sparge water is passed through the HERMS coil first (see my Brew Day Step by Step article for complete details). No dis-assembly or cleaning is ever required. Danger of the RIMS tube exploding if something was to get clogged. 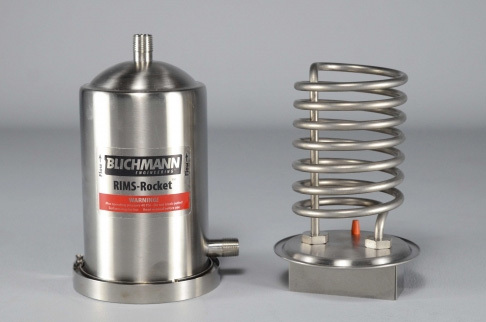 The Blichmann RIMS Rocket (for example) has a red rubber stopper that will blow if ever a dangerous pressure situation was to present itself, allowing the boiling wort to escape. I guess boiling wort spraying all over the room is less dangerous than shards of metal. This situation can never present itself with HERMS given that the wort is never heated past the temperature of the HLT. What are the benefits of RIMS? Possibility of faster heat times. Because a much smaller chamber is used to heat the wort, all things being equal a RIMS setup will heat the wort faster than a HERMS setup as there is less volume to heat. A HERMS setup may have 10-12 gallons of HLT water to heat while a RIMS chamber may only be half a gallon to a gallon in size. When added to the MLT volume that could easily mean that a RIMS setup may need to heat half as much volume as HERMS. Logic dictates that it should therefore heat about twice as fast as the less volume an element is heating, the faster the heating will occur. Unfortunately most things are not equal however between RIMS and HERMS setups: In order to avoid the risk of scorching, RIMS users will often use less powerful heating elements in their RIMS chamber. A 5500W/240V element running at 120V is a popular choice as it produces 1375W (1/4 the power). At this lower power output the risks of scorching or denaturing enzymes is greatly reduced, but of course, heating times are increased as it's only 1/4 the power output now. The higher the power output on the RIMS heating element, the higher the flow rate has to be to avoid avoid scorching. This may require faster pumps and careful attention to design. Unfortunately the faster the flow, the more chance of we have of compacting the mash grain bed too which in turn impedes the flow and we're right back to possible issues with scorching. It's a balancing act that RIMS users who want the fastest heat times have to live with. For me, HERMS is simply a better choice with less risk, less cost, and works well with my brewing process. I see no advantage to using RIMS, only higher cost, more risks, more complexity, more cleaning. I've been using my HERMS setup since 2009 and there hasn't been any situation where I wished I had a RIMS setup. There's nothing I'm missing, nothing I wish I could do that I can't do today, nothing that I can think of that I won't be able to do in the future. This includes 3-4 hour complex multi-step mashes which are possible on either setup. If faster heat and ramp times are needed in the mash, I still recommend HERMS but suggest doubling up the number of heating elements in the HLT. That will cut your heat time in half. Our 50A Control Panel for 30+ gallons is perfect for this, and isn't just beneficial with larger batches. Someone brewing 10 gallon batches could use this control panel and stick with one heating element in the boil and use two in the HLT. The benefits of quickly ramping through temperatures in a multi-step mash is questionable however as enzymes don't act instantly. I would only consider more power in the HLT because you're looking at shortening your brew day, not because you're interested in making better beer. (Most brewers, including myself, rarely do step mashes anyway). You may have different needs/requirements so make sure to review and consider everything before starting your build. Feel free to post thoughts/opinions in this thread as well. 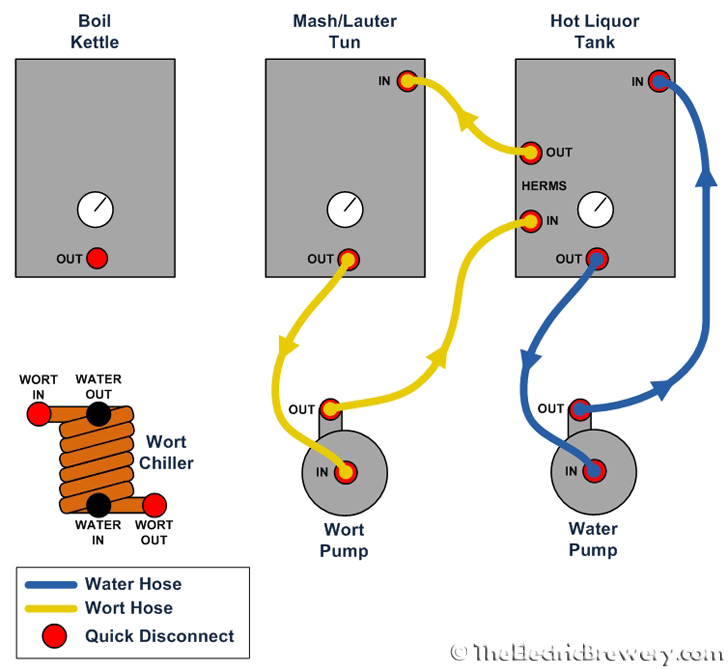 More information on HERMS is available in our Hot Liquor Tank build article. For complete details on our brewing process from start to end, see our BREW DAY STEP BY STEP guide. If your wort is mashing at 152F in the MLT, what temp would you set at your HLT for the HERMS recirc? There are only 3 choices in life: God, brewing your own beer, and eventually, death - I choose all three! That varies depending on each setup and how much losses each system experiences. Most people only need a few degrees above target mash temp. My system is larger with 30 gallon kettles and requires a bit more but still only like 5 degrees over target mash temp. Both my HLT and MLT PID temp probes are calibrated to mash temp (~150F) using a NIST certified Thermapen. If you use the exact parts I recommend (including the same thicker hoses, same kettles, and same pumps) you should achieve the same results. I know of at least one or two people here on the forum that had a difference between HLT and MLT such that they had to always set the HLT temperature higher. They did not want the temp lag between HLT and MLT anymore and changed their hoses and pumps to be the same as what I recommend in the instructions and the temp difference went away. Otherwise it's perfectly normal (and isn't detrimental) to simply set the HLT a couple of degrees or so higher if you have to compensate for heat loss. @ wscottcross - Interesting, only 5 degrees - I thought it would be more than that ..... Thanks. @Kal - I'm ordering the book either later today or tomorrow, so I will be able to follow what you are saying about the thicker hoses, pumps etc. My system will have to be much smaller than yours, (yours sounds great, and looks beautiful by the way) .... just NOT in my price range . Do you have an opinion about whether or not it's advisable to wrap the HLT and MLT with bubble wrap for insulation? I couldn't do that with gas-fired or using a cook-stove, but with the elements being inside the pots, it would be possible without worrying about melting/fires, etc. I understand some would say that there is a conflict with aesthetics, but in my case, I'm probably the only person that will see it, and it is in a converted bathroom, so the room is very small. I'm just wondering if you feel that the insulation will truly help the pots to hold the heat better, thereby saving money and energy in the process. Do you have an opinion about whether or not it's advisable to wrap the HLT and MLT with bubble wrap for insulation? Wrapping both will get you to target temperature only very slightly faster (IMHO) but may help a bit if there's a temp differential. How much energy/electrical cost you save is not something I'm familiar with. Would depend on ambient temp, effectiveness (thickness) of insulation, etc. I didn't consider insulating because it's something else that gets in the way when it comes time to clean the MLT and over time would likely get ripped/banged up/etc. (The HLT is never cleaned since it only ever has water). Actually, I wasn't thinking about getting up to target temps, I was more considering maintaining mash temps and boil temps so the elements won't have to cycle on and off as much. Hadn't thought about that - something to consider, for sure! I guess if I did go that way, I'd have to make it easily removable, either cloth-covered and zippered (not really an option AFAICS), or by using velcro strips. (The HLT is never cleaned since it only ever has water). It gets pretty dusty here, since we heat with wood and the wind blows daily, almost constantly ....., so I figure I'll have to clean it often, even tho I'll keep a lid on it ;>). The wife is constantly having to dust the home. Sure. An insulated vessel will lose less heat so the element would not need to fire as often to maintain boil or temperature. How much cost savings this results in over time is math that I wouldn't want to try and calculate this early in the morning. It's probably only pennies. Depending on which kettle you build it for, whatever you do you'd have to make sure it can withstand up to boiling temps (212F/100C). Dust on the outside could be just wiped down with a damp cloth. I meant more that there's no scrubbing/washer/hosing down of the inside required in the same way as the boil kettle or MLT. The HLT is definitely less work. How much volume do you need in your HLT to cover the coil? I'm trying to weigh the pros/cons of a HERMS vs standard single infusion (in something insulated like the SS Mash tun). I think in general I'd be fine with infusion mashing because I do very few step mashes, and have grown fairly proficient at hitting mash-in temps. But I'm wondering which system would be best for 5 gallon batches (using 20gal kettles) where an infusion mash would lose the most heat (lots of head space, low thermal mass), but also doesn't need a huge volume of sparge water. Do you ever have to use way more water just to keep the HERMS coil covered? If I end up doing 75% of my batches as 5gal instead of 10, would you still recommend HERMS over standard infusion? That depends on the kettle and the coil used. They're all different. For me with my 20 gallon Blichmanns and my hand wound 50' HERMS coil it's about 11 gallons. I'm trying to weigh the pros/cons of a HERMS vs standard single infusion (in something insulated like the SS Mash tun). I mostly do single infusion myself. 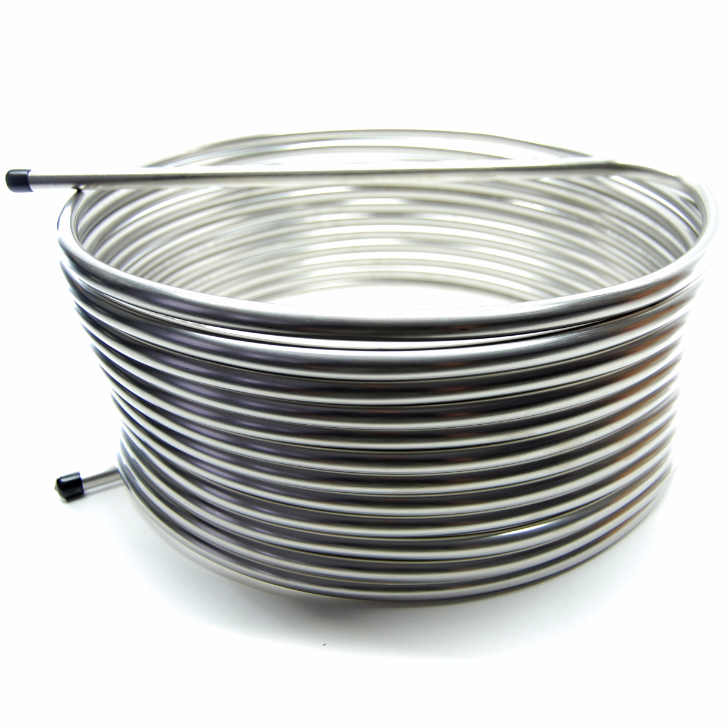 The benefits of the HERMS coil is to hold/maintain temp, not necessarily (or only) to do step mashes. You may also be doing at least one step however: To 168-172F mashout (I do this even with single infusion mashes). An insulated mash tun will help hold heat, but unless you recirculate with HERMS or RIMS, it'll never hold it forever. The other benefit of HERMS or RIMS is that you don't have to get the temp exactly perfect. It'll compensate and adjust. Otherwise you're using online calculators to get close and then have to add hot or cold water to fix. Do you ever have to use way more water just to keep the HERMS coil covered? If I end up doing 75% of my batches as 5gal instead of 10, would you still recommend HERMS over standard infusion? I think you may be confusing the issue. HERMS has nothing directly to do with single infusion. HERMS is a way to maintain and hold temp reliably, regardless of how many steps you do (Single, or multiple). By infusion mashing I just meant the low-tech, no heat applied method. I guess Im just trying to understand the value of the additional investment and complexity needed for HERMS in order to hold temps exactly rather than just letting them fall a degree or two. I think I'm sold, but am still trying to quantify the complexity piece. So when you do smaller batches you don't bother covering the entire coil? Do you have to increase the HLT temp to account for that "lost" surface area? Any other changes for smaller volumes? I'm sure I'm over thinking this..
By infusion mashing I just meant the low-tech, no heat applied method. I guess Im just trying to understand the value of the additional investment and complexity needed for HERMS in order to hold temps exactly rather than just letting them fall a degree or two. I think I'm sold, but am still trying to quantify the complexity piece. If you have a multi kettle setup (not BIAB) adding HERMS isn't overly complex. All you need is the coil and an extra pump, plus probably a few extra fittings. It's pretty much a given that if someone does an electric 3 kettle setup it's either going to be RIMS or HERMS as it doesn't add much more in terms of complexity but rewards you in spades. That said, everyone has different needs/requirements. So when you do smaller batches you don't bother covering the entire coil? I do mostly 10 gallon batches. If/when doing 5 gallon batches, I would still make sure it's covered even if it's not used. It's only a few extra gallons of water. Do you have to increase the HLT temp to account for that "lost" surface area? You can't do that. That would not work / would be incredibly finnicky if it did / would negate the whole point of having an easy to use electric setup where all you need to do is set the temperature and forget about it (it maintains/holds). Any other changes for smaller volumes? Depending on your kettle sizes, there's going to be a limit to how small you can go however. You probably can't (for example) brew 5 gallon batches in 55 gallon kettles as you can't even get the heating elements covered with wort or water. If you have general questions about what way to take your build, I'd suggest starting your own brewery build thread to hash things out. I'll chime in there as will others I'm sure. This helps keep everything in one train of thought as this thread is really a FAQ about HERMS vs RIMS. 1-The water will be warmer by the elements on the bottom if there are any temp variations. Recirculating minimizes this, but i suspect there still exists a temp gradient because the water will cool some going to the pump and back out to the top of the kettle. I didn't see any noticable temp diffs in my 20g pot with dual elements. But i have to think when firing that the water next to the elements is hotter even if by 1 degree. So if there is a "warmest" place in that HLT it's by the elements in the bottom. 2-The other thing is that the top of the coil may become exposed if you're doing a larger batch that required a bunch of strike water. 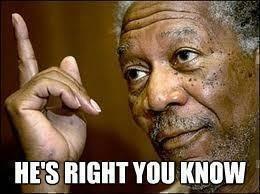 From what I can tell Some people top up, some people just adjust and work with it. Topping up seems to work well if you heat above mash temp for strike and need to cool down. But then you have to worry about treating the water if you have chloramine and/or salt additions. But if you are exiting the bottom of your coil then the exposed top part doesn't have much affect... as your wort is leaving/exiting through a submerged coil and will most likely be the same temp as the water. I know the hose is probably 1-2" longer to go from the bottom port to the MLT... but the alternate way of leaving the top port and possibly exiting through 1-2" height of exposed inside coil is the pot would be a distance measured around the radius of your coil. I have a 14" coil so i'm looking at at least 40in of exposed tubing before exiting the top port. Or if you go int he top then 30-40in of "less hot" tubing before being submerged in mash temp water and then exiting the bottom port. I don't think I've ever had to top off my current system to get the water line above my coil. My 20 gallon kettle is actually 22.7 gallons to the top. The top of my coils are around the 13 gallon mark. I normally only use about 7 gallons max to mash in. So I'm always above the coil, even just using 20 gallons to start. To your first point. I believe I would rather my wort travel next to the element FIRST to get the most exposure to hotter temps and balance out by the time it exits the coil. Another reason I prefer to start at the bottom is so that gravity plays a part in keeping the coil always completely full of wort. A forum member previously posted the results of an experiment (several months ago) with wort entering the top and bottom of the HLT coil. "We did our experiments twice, once with the wort entering the coil at the top and leaving on the bottom and once the other way around. It turns out that having the wort in the HLT coil flow from top to bottom is more efficient that from bottom to top." Careful what you conclude. Many would say that that experiment was flawed and therefore the conclusion meaningless or that the tests were very specific and the results can't be taken to apply to every setup (I would agree). They (for example) use a lower flowing pump that nobody in North America uses.